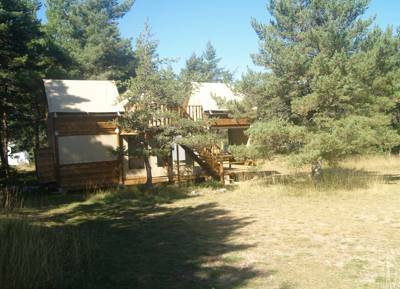 A comfortable bungalow for 2 to 4 people, tucked away in the pine forest, with its own outdoor area to kick back and relax. 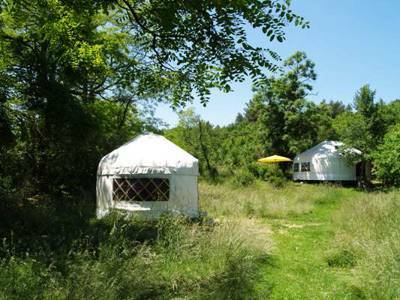 A large Yurt in a natural setting for up to 4 people. Our yurt campment has its own shower & toilet block. 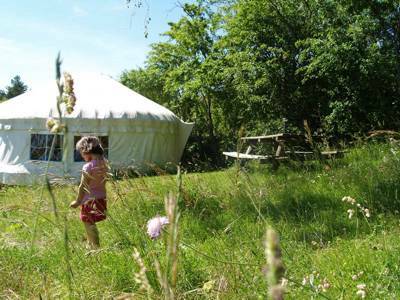 A cosy Yurt set within a wild meadow with wild flowers and on the edge of the wood. This Furnished Tent is a spacious canvas mini cottage with room for up to 5 people to sleep. This Furnished Tent is a spacious canvas mini cottage with room for up to 4 people to sleep. 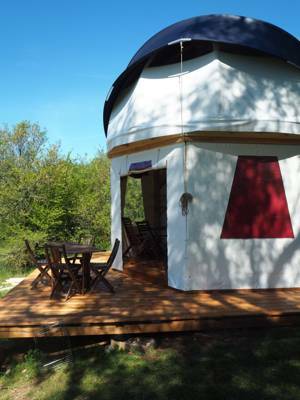 'Le Nid' - is a wooden camping structure just like a crows nest or a tree house, for a stay with added fun! Le Nid - Wooden Tree Camping! A quirky tent with a clear pvc dome over the bedroom on the 1st floor. Living area on ground floor. 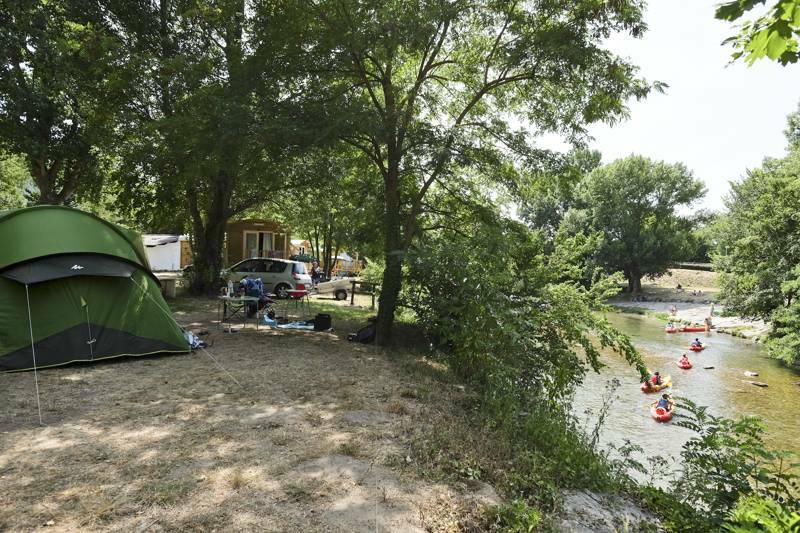 A choice of spacious pitches in a meadow with open views set in the stunning Cevennes National Park. 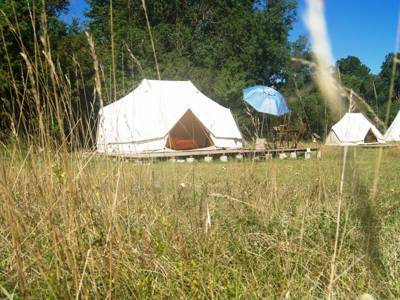 A wonderful famiy-orientated site set in the stunning Cevennes National Park. 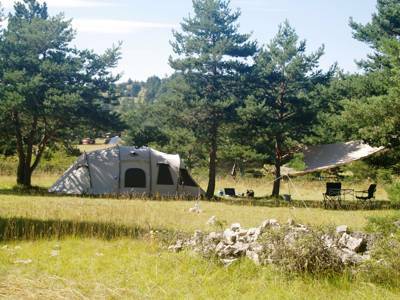 A choice of spacious pitches in a meadow with open views or in a pine forest set in the stunning Cevennes National Park. If you like your campsites to come with a healthy dose of history, check out Domaine de Pradines. According to official documents connected to the property, the site was once owned by a certain M. Cambacères, a key official in Napoléon’s government. Indeed, Napoléon is said to have stayed here during the period of his Egyptian campaign, for which Cambacères planted some trees following the outline of the imperial eagle as a welcoming gesture. Today’s incarnation of the campsite is in the capable hands of Virginie (from France) and George (from Scotland), who have been in charge of the place, along with their respective families, since 2006. Situated slap-bang in the middle of the Parc National des Cévennes and Parc Régional des Grands Causses, Pradines is as idiosyncratic as they come. It boasts Turkmen yurts, a series of vaulted buildings that date back to the 13th century, wooden chalets, and an almost unbelievably large tract of land (370 acres/150 hectares) that’s mostly left wild.Almost.Seventy-four acres (30 hectares) have been reserved for the main camping site, a vast and fairly unruly space that has a touch of the savannah about it, helped by the African-style BBQ-eating area and tall, blonde grass. 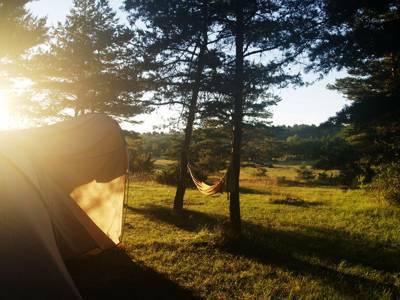 Campers can choose to take one of the huge spaces around the periphery of the field, or lose themselves completely in the woods. Either way, it’s unlikely you’ll be disturbed by your neighbours unless they’re shouting through a megaphone; and unless you have powerful binoculars, you won’t be seeing many of them either. While the owners admit that the rugged feel of the site isn’t for everyone, it’ll certainly suit anyone with a sense of adventure or with a yen for nature. Besides, it’s not so rough really – the amenities include a shower block ensconced in a charming old vaulted stone barn, a kids’ playground, a pool, a restaurant, a reception with a well-stocked shop... you can even get wi-fi here if you need to. The real idea, though, is to get a bit closer to nature. To take a memorable hike or adrenalin- pumping raft trip through one of the nearby gorges – the Tarn, Jonte, and Dourbie are all within easy reach – outdoor playgrounds that offer a multitude of activities, from climbing and hiking to kayaking, rafting, and canyoning. You can even paraglide if you want to see the area from a bird’s-eye perspective. 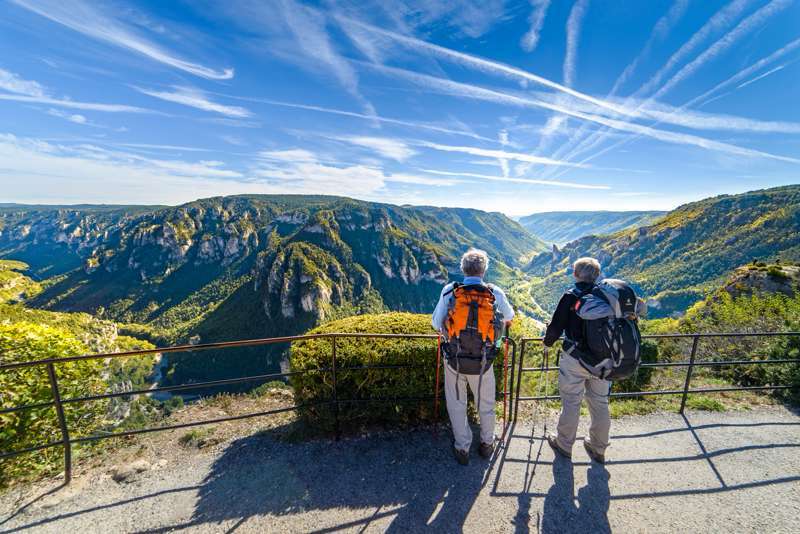 Or explore the forests, granite hills, and magnificent caves of the Cévennes; a decidedly different landscape, also in close proximity.There are places like the charming holiday town of Meyrueis to visit. Or try Millau, once the largest pottery-production site for export throughout the Roman Empire and home to the marvellous Millau Viaduct, the highest bridge in the world (designed by Sir Norman Foster). Guided walks and maps are available from reception. Plus there’s canoeing, climbing, parascending, horse-riding, potholing, and caving nearby, and, of course, the campsite’s expansive terrain, which includes wild flowers (including 30 species of wild orchid among other rarities), birds, and butterflies. Maybe you’ll find something older than a coin from the 4th century bc. A dinosaur footprint maybe? 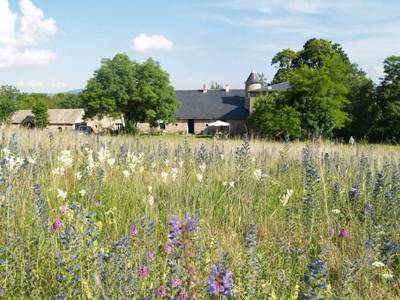 Domaine de Pradines, situated in the beautiful Cevennes National Park, is a stunning tranquil escape, where starry skies and nature prevail. For latest availability and best prices for Domaine de Pradines, please use the Date Search above. There are 50 camping pitches, all spacious, some with electricity (bring a long lead). Three communal BBQ areas, 50 huge pitches, 48 of which have hook-ups, some close to sanitary block, others further, sun, shade, a bit of both and finally there's semi-wild camping for the more adventurous or complete tranquility seekers. 9 hot and 2 cold showers (including a hot shower with disabled access), washbasins in cubicles, washing-up sinks, washing machine, and dryer. Swimming and paddling pool, 2 tennis courts, boules court, children’s playground. Restaurant with a beautiful vaulted ceiling typical of the region, takeaway food options, shop, Internet access, volleyball and badminton courts. No campfires. An embarrassment of riches awaits. There’s the Grotte de Dargilan caves (00 33 4 66 45 60 20) or the famous Roquefort cheese caves (00 33 5 65 58 56 00); the Micropolis Insectarium will appeal to creepy-crawly lovers of all ages (00 33 5 65 58 50 50). Fremyc (00 33 6 58 13 48 48), in Meyrueis, organises rafting, canoeing, walks, bike rides, speleology tours, via ferrata, and more. Airzone Parapente (00 33 6 60 84 76 23) can organise tandem rides over Millau and the Grands Causses. Randals Bison (00 33 4 67 82 73 74) offer cowboy-style riding on their bison farm. Great walks and wild river swimming are easy to find and there are a variety of activities such as canoeing down the Tarn river, hiking, horse riding and visiting Templar strongholds all locally accessible. Pradine’s auberge serves food in July and August in an ancient building with an impressive stone vault (formerly a Templar chapel). It has a pleasant grassed terrace and there is also a small shop on site which serves fresh bread daily. The village of Lanuéjols has a hotel-restaurant and bar called Hôtel Bel Air (00 33 4 67 82 72 78), which is informal and family-run. Meyrueis is a bustling village in the summer with a weekly market, shops and wide range of cafés, restaurants and bars such as Hôtel Family (00 33 4 66 45 60 02), Hôtel du Mont Aigoual (00 33 4 66 45 65 61), which has good food and a down-to-earth atmosphere, and Le Jardin des Glaces (00 33 4 66 45 43 75), which serves up local specialities. For local restaurants, try Ferme Auberge de la Tindelle (00 33 5 65 59 18 39) and the wonderful Lou Puech in St André de Vézines, which serves excellent hearty and rustic meals from home-grown and local produce. Farms in the region rear unique brebis sheep that produce rich milk used to make Roquefort in you've guessed it Roquefort not far from Millau. Try Au Marché Paysan – Magasin de Producteurs Fermiers in Millau (00 33 5 65 61 39 35) as well as Terres d'Aigoual in the Parc des Cévennes also a cooperative of small local producers. Camping officially from the start of June – mid September, in May too depending on the weather. Yurts can be rented mid April – mid October. Gîtes and chalets open nearly all year (reservation necessary). 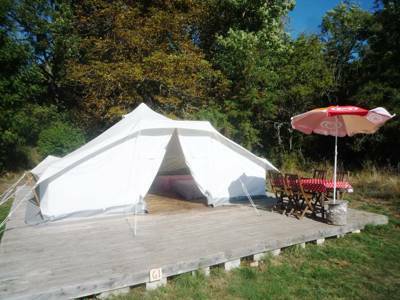 Tents: 2 adults/night 12–17€ (electricity 3€); large yurts (sleep 4) 570€/week (high season), 350€/week (mid season); 2 pers-small yurt 280€/week (high season) and 170€/week (mid-season), 4 pers-bell tent 55€/night, 5 pers-tent 62€/night, minimum 3 nights high season. Gîtes and chalets (sleep up to 6) also available. Pradines is 35 kms east of Millau, and 11⁄2 hours north of Montpellier, 2 hours west of Nîmes, 3 hours’ drive south of Clermont-Ferrand.